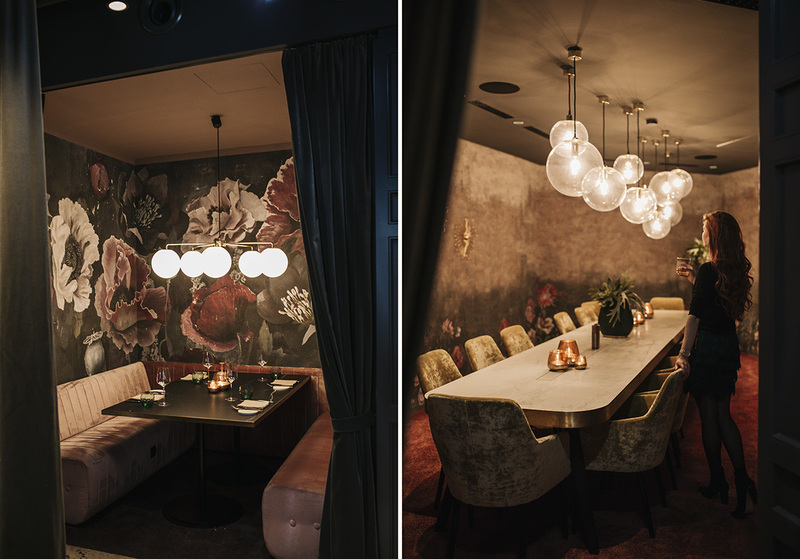 Ladies and gentlemen let me proudly introduce you to the new restaurant at the Vienna gourmet scene – welcome to Apron! 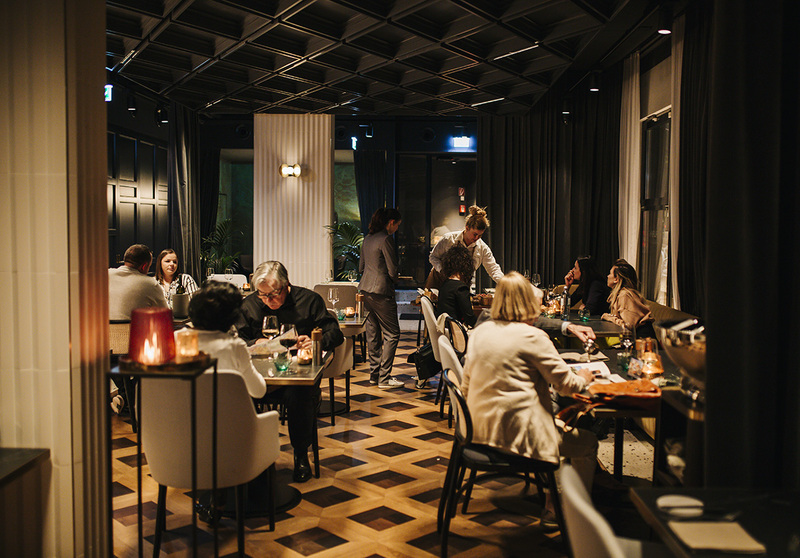 Opened this June, Apron already earned two honorable toques (in German: begehrte Hauben) from Gault Millau, that placed them to the list of the officially best restaurants in town. And this means only one – it is run by a team of culinary and gastronomy professionals. No matter if you live or just visit Vienna, I am positive that this restaurant is more than worth visiting and that it will wow you. It is a genuine Vienna Insider gem! Apron is located in the 3rd district (just 3 min walk from the Ring street and very close to the historic heart of Vienna), and it is part of the Hotel Am Konzerthaus. 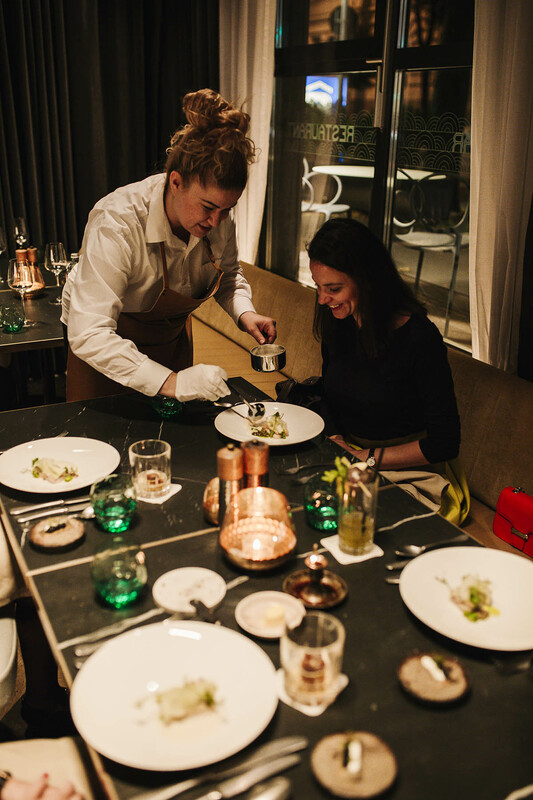 Apron is a fine dining restaurant, that puts a special accent on course menu or in German known as Gängemenü. Apart from this, you can of course always eat a la carte. From Monday to Friday they also serve business lunch (it is changing weekly and you can take a look at it here), and have an extraordinary bar. The interiors is very elegant and sophisticated, as you will be able to see at the pictures below. What I especially loved is that there is a VIP area, that you can book for private events, or just a cozy loggia where you can have business conversations without anyone ear dropping. 😀 And needless to say this blush pink color totally got me! There is a unique concept behind Apron, that turns dining into a spectacle for all the senses – the taste buds, the eyes, the scent. Why Apron? The name doesn’t come simply from the apron we use for cooking. The restaurant itself is located between the Concert house and the Akademietheater. And when talking about theater, apron is the word signifying a particular type of stage. You can check good old Wikipedia if you want to learn more about the apron stage. So the arched sign, that you will see all over Apron’s website, cards and below on the window, was chosen to symbolize this stage. It is a subtle way to indicate their unique concept. “Back stage on stage” – it was how Apron’s architects named the concept. In Apron, kitchen is open, it is on stage for you – the audience to watch, but also to be part of it. 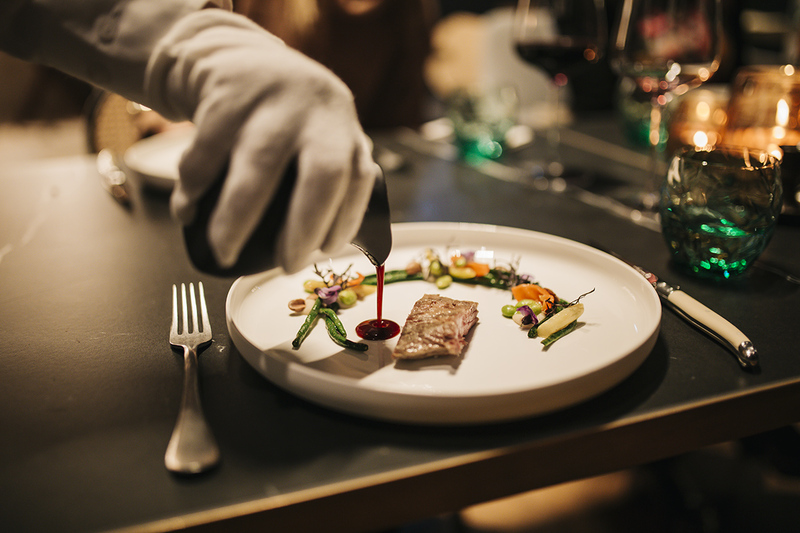 Apron is a restaurant that celebrates the art of dining and stands for world class, personalized service. 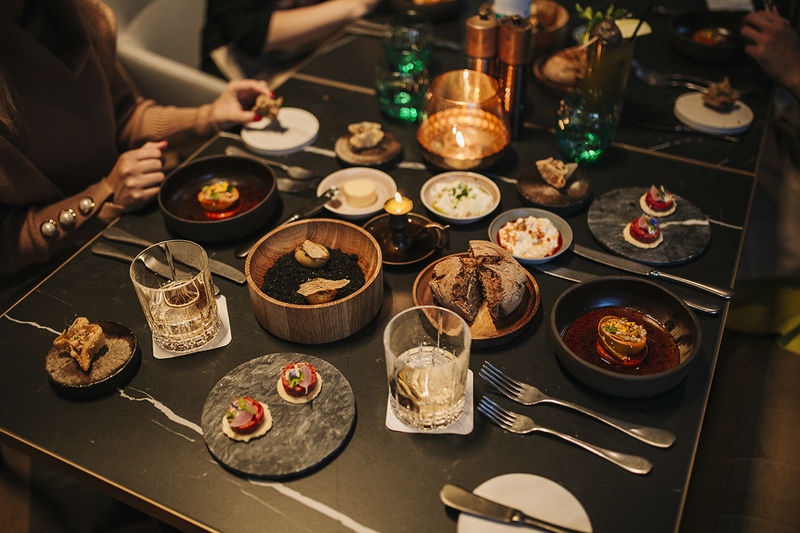 Each dish has its story, that is presented to you by the hosts. Broni was our host, our gastronomic narrator for the night. With a lot of enthusiasm and the highest level of professionalism, Broni was presenting us each dish, the ingredients and what is special about them. She was there to answer all our numerous questions, tell us about the chefs and how the team works, to share curiosities, to assist us with the choice of drinks and wine. This whole presentation and Broni’s approach gave an emotional dimension to the taste of the dishes we have been savoring. Everything was pure perfection. Our gastronomic adventure in Apron lasted around 6 hours. Don’t worry if you come as a normal guest I am sure you can finish a lot sooner, it is just that we got distracted taking pictures, socializing with our hosts (:D) and fully indulging each and every bite. Broni told us we will be served the 7 course menu, but I am pretty sure we tried more than 20 different flavors that evening. 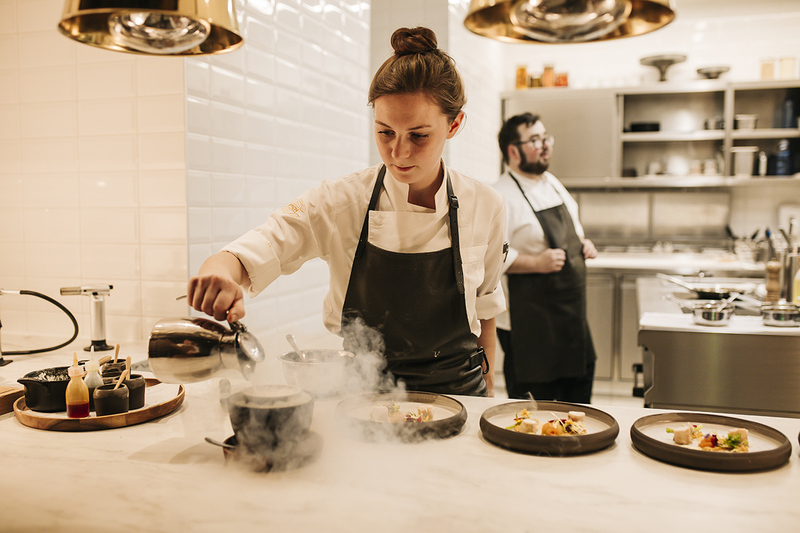 Many dishes included special effects and elements of the molecular cuisine, such as steaming, evaporating, burning or melting. 1.Take a seat and enjoy the unforgettable gastronomic show that will touch all your senses. Apron experience is like being in a one of a kind theater. From starters to desserts, the courses unfold like theater acts, right there in front of your eyes. The kitchen is open, so that you can watch the performance of the chefs creating the dishes. Then, those dishes are being presented to you by the hosts. The guests are the audience, the main reason why the entire show is going on. The best part is that unlike in regular theater, you don’t merely get to watch, but also to taste, smell, to engage all of your senses and participate in this entire show. The first act of the culinary theater was the butter candle! Yes you read it right. A genuine candle made of butter, that Broni lit, and then poured a delicious sauce made of roasted meat, in the holder. The butter was melting like wax, directly into the sauce. We ate the sauce with homemade crispy bread and it was amazing. Besides the candle all these amazing little plates you see here are served like a pre first course. So while waiting for the cold appetizer (which is the fist course) you get to indulge in all this deliciousness – mini beef tartare, a crispy bites with peanut, smoked baby potatos stuffed with porcini mushrooms, served on edible olive-dirt (! ), homemade ricotta cheese with two different sauces, the butter candle, another superb butter, and pumpkin flower in the most amazing sauce ever. The menu is seasonal, meaning that if you visit, you will probably get some variation (so instead of the pumpkin, but I am sure the butter candle stays!). 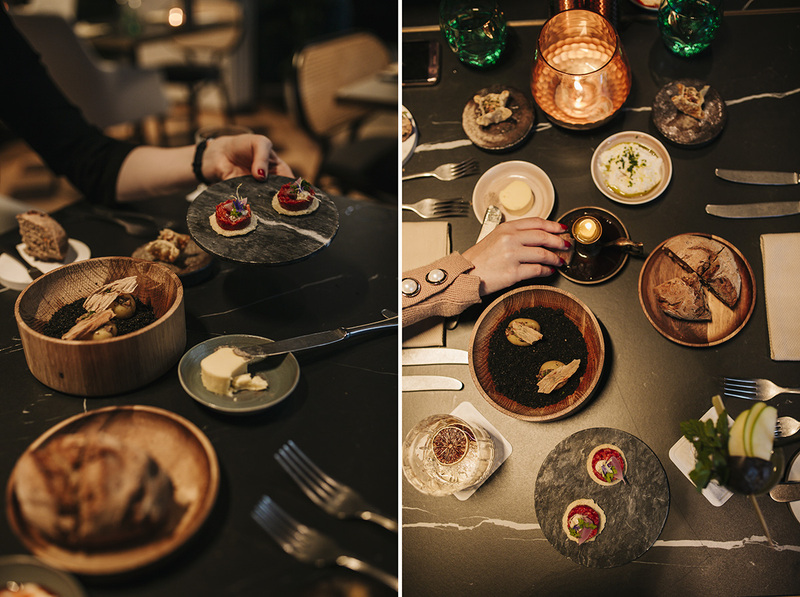 After this, we got our first course – cold appetizer (hare wrapped in lardo with tomato snow) and warm appetizer (smoked fish with peas). 2.Indulge in specialties made by culinary geniuses. The Apron team is made of true professionals with decades of experience. The head of the team is Michelin star chef Mr. Stefan Speiser, working hand in hand with young talented chefs. The kitchen is open, so you will be able to see these people in real action, cooking and assembling the pure art on plates. There will always be something different awaiting for you in Apron, as the menu changes monthly. And don’t worry folks, even if it is fine dining, I am positive that you won’t stay hungry! The portions are really fair. 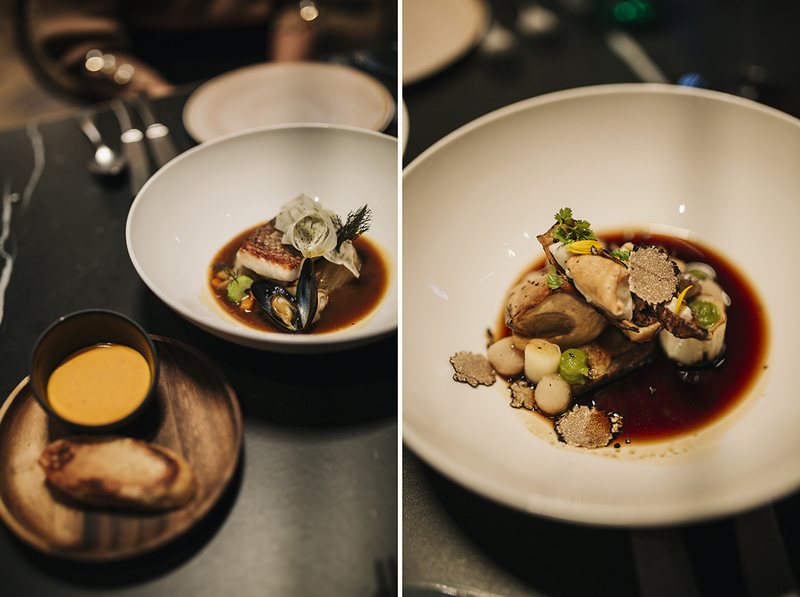 Our third and fourth course – On the left you see main course number 1 – sea bass fillet with bouillabaisse sauce; and on the right the savory dish all of us loved the most (actually this is sorted as warm appetizer) – oyster mushroom with black truffle, topinambur, pear (these little balls is pear!) in perfect black tea sauce. It maybe sounds strange but the whole combination is just mind blowing! Broni will always bring you an extra spoon with all the dishes. She told us she already knows the guests will ask for it, because Apron sauces are too precious to leave in the plate. This is a mini portion (made this small especially for us, because we already had too much food) of the main course number 2 – the softest pork ever, served with green beans and beans puree and a delicious sauce. 3.Try the most exclusive ingredients produced in Austria. All dishes in Apron are made from premium, regionally supplied ingredients. You can try caviar that comes from the Upper Austrian Alps. Caviar made in Austria? I bet only few of you may know, that this black gold, one of the most expensive ingredients out there is being produced in the Alps. To name one more, in Apron meat connoisseurs can indulge in extraordinary boa beef, organic beef coming from a special sort of grass-fed cattle. Boa beef can only be tasted in a few restaurants out there, and Apron is one of them. And in some desserts, you will find things such as “Schönbrunner Zitrone” – it is a unique sort of lemon cultivated in an exclusive citrus garden in the Schönbrunn palace. Imperial touch to sweets, how amazing is that please? 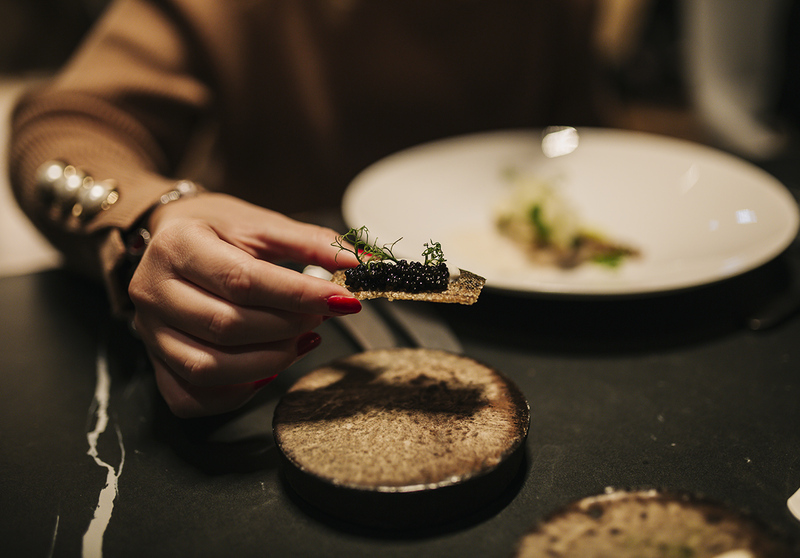 Austrian caviar, served on a crispy fish skin. By the way did you notice how cool all the plates are? 4.Everything is homemade. Smoked fish? Or crispy bread? Made in the house. Buratta (the most gentle cheese, made of fresh mozzarella and cream) – also made by the Apron team. Pretty much anything you get on the plate was made right there, in this restaurant that brings food on a totally different level. Chef Julia in action, making tomato snow! 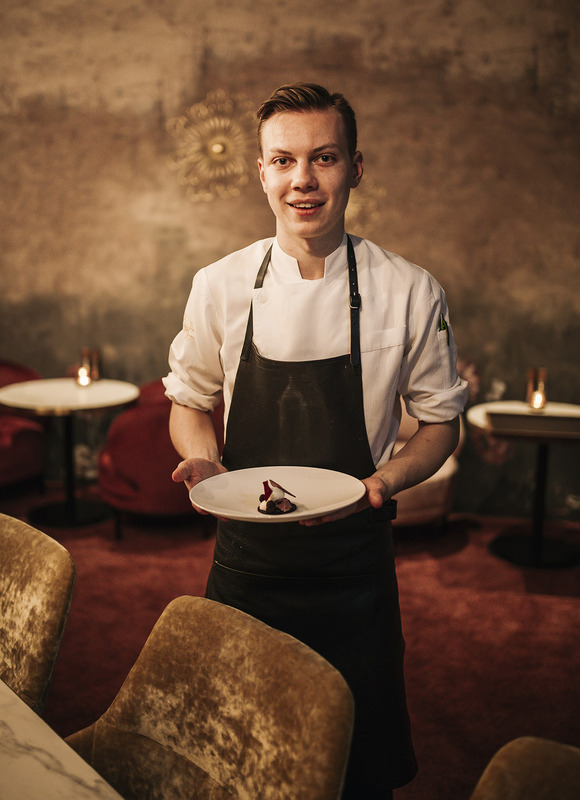 5.To get blown away with the sweet masterpieces made by the 20 year old head pastry chef Benjamin Schröder, the youngest member of the Apron team. 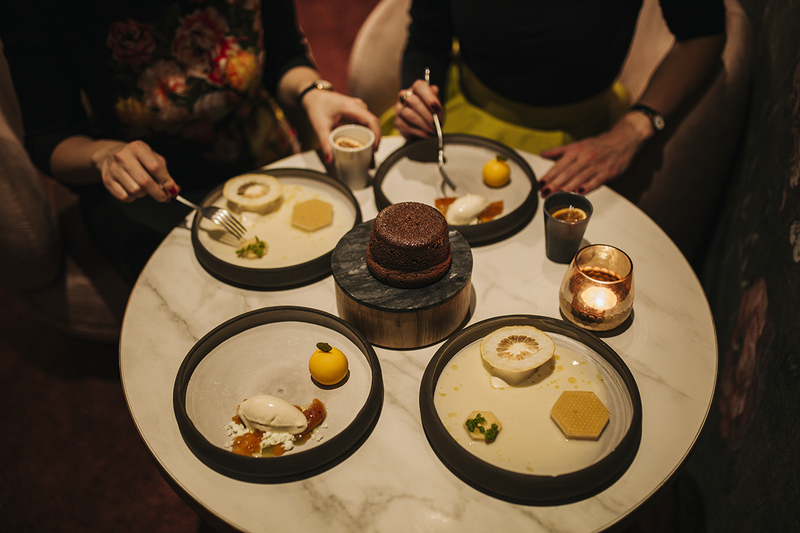 Just when you think, your meal cannot possibly go any better, after all the phenomenal savory creations, comes Benni with his mind blowing desserts. First comes the pre dessert, to neutralize the savory dishes and prepare your palates for the sweet heaven coming up. In our case it was banana-lovage-fennel, probably one of the most unusual flavor combination that we ever tasted. On the right – the goat cheese-berry creation with homemade chocolate. A dream for all of you into cheese cakes and fruity desserts. And then the sweet highlights started unfolding. We tried milk and honey semolina dessert served with dried lemon from Schönbrunn that Benni created to evoke his childhood memories on an elevated level (you see this honey comb shape? This dessert was so gentle and sophisticated, we scraped off the entire plate :D). And the best chocolate souffle you can possibly taste (if you like me, are crazy for cooking shows like master chef you know how difficult it is to nail a souffle) with homemade ice-cream and apricot. And these plates, Broni told us come from the same porcelain brand from England, that make dishes for the royals! And then when we thought that’s all folks, Benni brought one last surprise! It was a set of mini desserts (homemade of course!) 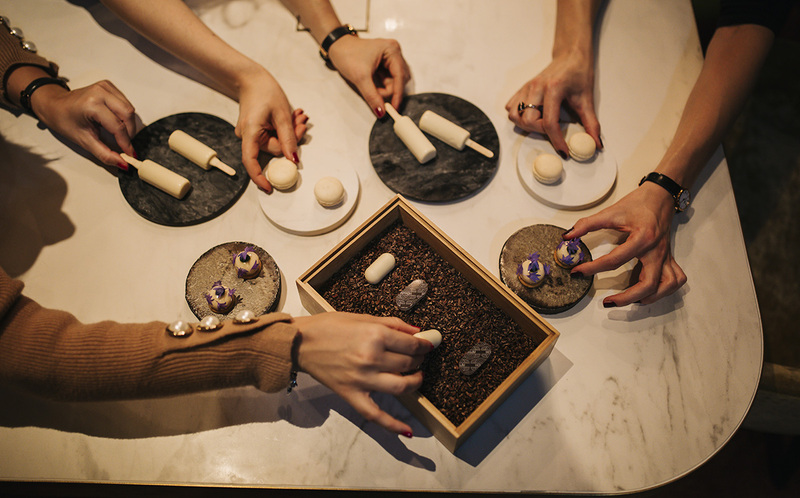 consisted of vegan chocolate ice-cream (popsicle), tonka bean with kaffir lime and parsley, pralines and the most perfect macaroons ever! Thank you so Benni! Everything you brought us, this joy was bigger than Xmas! 6. Enjoy the world class, personalized service. 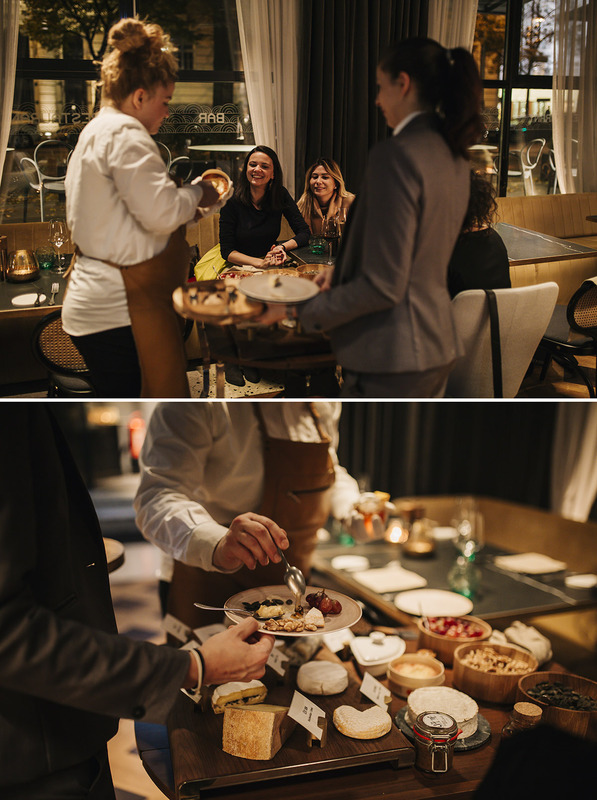 Apron team is made of genuine gastronomy professionals, who strive to make every guest feel welcome, cater for their needs and provide them with a premium, personalized experience. They are open to adjust the dishes to fit your taste, assist you with making the right choice of food and wine. You can rely upon their recommendations, because the entire Apron team actually gets to taste the menu, before it is being launched. This outstanding approach to guests, all this people smiling from the heart, making you feel so welcome and pleasant, wowed us. As I already said before, we were able to enjoy all these specialties not only to the fullest, but elevated to another level, thanks to our lovely host Broni and her colleagues. Sorry but I lost the count, have no idea which course the cheese was, but it came before the pre dessert. 😀 As you can see the selection is large enough and my girls especially loved this part! We all love cheese a lot. I was so full that I didn’t take any, but in the end I regretted my decision hahaha. I tried a bit from the girls and I really loved the truffel cheese and truffel honey! It went so well with the cheese, grapes and nuts. 7. Treat yourself with an unforgettable gastronomic adventure and learn what it means to SAVOR. 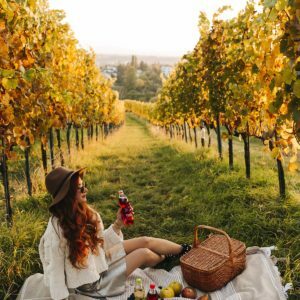 There is this perfect verb “to savor” meaning to “allow oneself to enjoy the pleasure of” and moreover to “taste (good food or drink) and enjoy it to the full”. Exactly this is what Apron celebrates – this pleasure in eating great food, the socialization around it and the present moment. Savoring is all about the present. Being here and now. 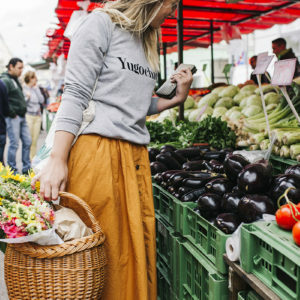 Food has the power to connect us on so many levels, because it engages all of our senses. This emotional experience creates memories that bring us back to that present moment we lived. Back to childhood, back to our grandma’s kitchen, back to that far away land where we tried some local specialty for the first time. 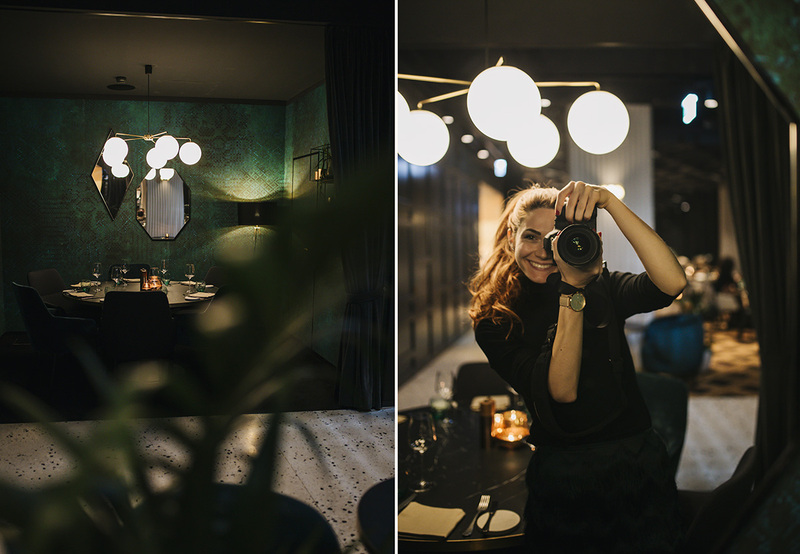 Back to that evening in gorgeous Vienna, when we visited a restaurant called Apron, tried so many dishes whose names we maybe forgot, but the memory of this feeling of joy and pleasure is something that never fades. My point here is to tell you – invest in experiences, collect moments, not things. Material things are also cool and necessary, but what what truly makes us rich are experiences. They are a direct the investment in ourselves, something that we own forever. Share a beautiful experience someone you care about. Time is the most precious thing that we gift to us and people we love. So sometimes instead of treating yourself or a dear person with a thing, choose an experience. Go on an excursion, to amusement park, to a theater, a concert, creative workshop or to a restaurant where you have never been before. Apron is so much more than a restaurant. It is a gastronomic theater that awakens all of your senses. A play with sweet and savory acts, where you see, smell and taste flavors, textures and ingredients that you have never tried before. You are the one that decides how long this show may last. Maybe you will just go for a coffee and dessert, a cocktail, business lunch, or like us to a 3-5 or 7 course menu. I know when I talk about fine dining, it might sound overpriced, but based on the entire experience you get there (I am talking in particular about the course menus) it is completely worth it and hence in my mind fairly priced (to inquire about the prices, check their website here). Anyways, I have no doubts that any visit to Apron will turn out memorable, thanks to the most important, irreplaceable ingredient – the team behind it. It is the people that make the place. Hope that this post was inspiring for you! 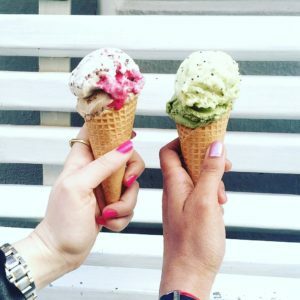 Our faithful readers know that I love writing about food and travel, so pardon my long ode. Just like any other text on our Vienna Insider blog, it came from the heart! I need to thank the whole Apron team for this unforgettable adventure, and most of all, for enabling me share this joy and enjoyment with my dearest friends. To experience beautiful moments with people I love is for me the greatest pleasure. I can’t wait to come back and bring my sister, my mom and some more dear people that are part of my life and that I know will enjoy this experience as much as I did. And because the girls loved it so much, down below in the comments, you can read their impressions and reviews from Apron as well. Not that it is only me talking here! And you are welcome to talk as well. For any questions, feedback or your experience from Apron, the stage in the comments is all yours! 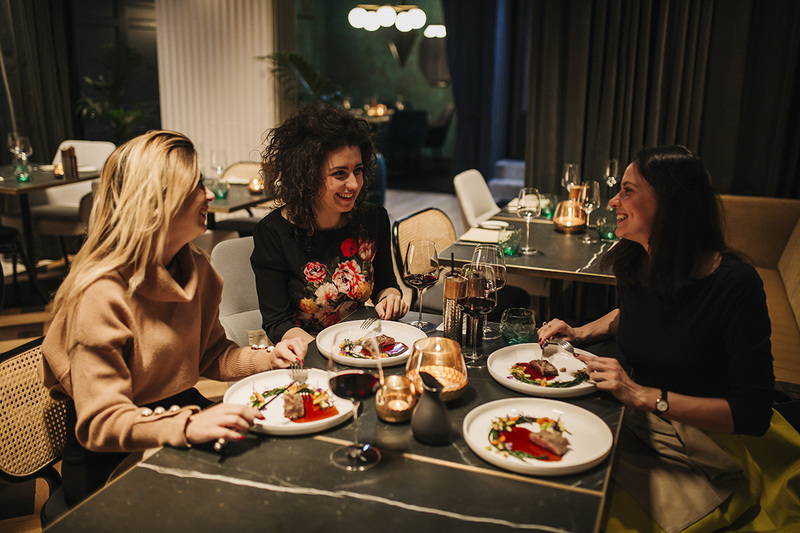 Culinary jury of the night – Anja, Senka, Spoki and me behind the lens. Can you tell they exploit me? xD Jokes aside, we felt like being in the master chef. This post was done in a friendly collaboration with Apron. All the photographs were taken by me Una Stefanovic Photography and are protected by copy right. You know that feeling when you want to describe something that happened to you by putting a simple metaphor? Well that is what happened to me. In order to describe experience at the Apron restaurant in the the most accurate way I tried to find that metaphor. But zero results came out, no mach found if you prefer. There is no such a metaphor that could compare to my experience at this restaurant. What impressed me the most is definitely the stuff. Whole team where each and every one of them had their duty with one purpose: to keep the guests satisfied. For the moment I felt like I was in a theater just by looking at the stuff and allowing myself to be amused by their little “performance” while preparing, presenting and serving dish after dish. Smiling faces made those dishes even more tasty. 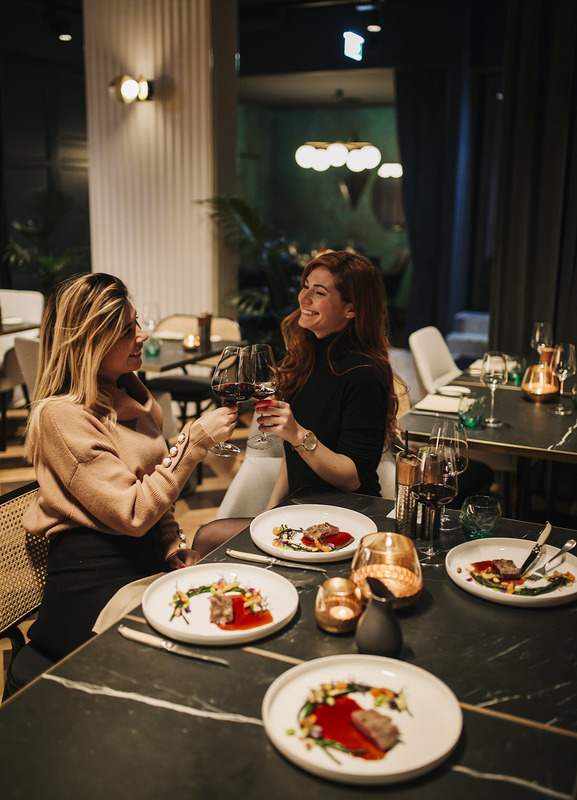 So, if I would try to simply describe Apron restaurant I would probably say: Just imagine the best place, the best food, the best service you can get at any restaurant. Well put all that on the next level and you might get close to what I felt after leaving this restaurant. So, back to the beginning – there is obviously not such a metaphor do describe this whole experience and that leaves me with this one word – UNIQUE. Period. Apron is a place not only for filling up your stomach with delicious food but also for enjoying a rich culinary journey. 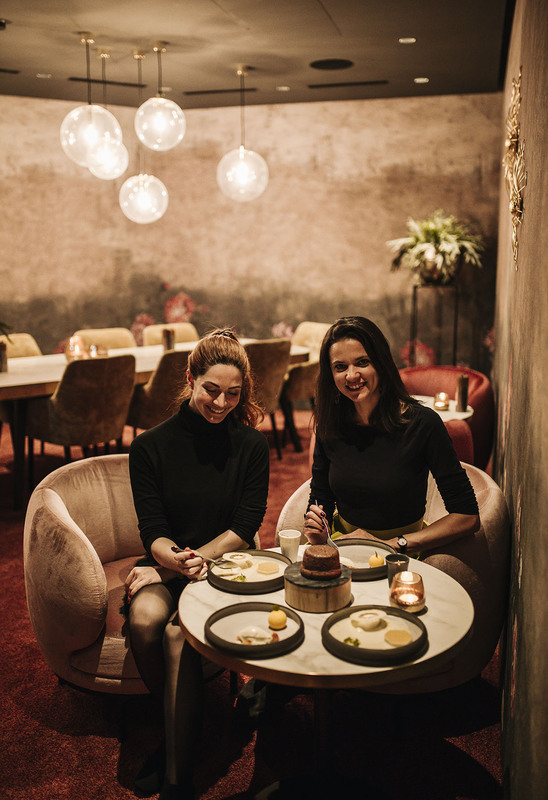 The friendliest staff in Vienna (and beyond, I guarantee) will take you on a journey, starting from the cooking process to the eating ritual. It is nearly impossible to list the highlights of our Apron experience (since everything was pure perfection), but what made the biggest impression on me was the friendly and professional Apron team. Next best highlight goes to the desserts. 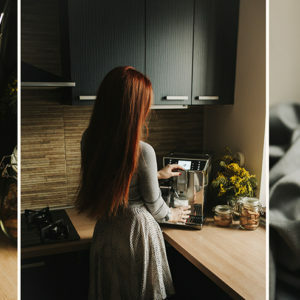 Especially because do not usually have a sweet tooth, Apron creative and experimental desserts could from now on substitute my breakfast, lunch and dinner. Imagine traveling to a culinary wonderland. Well that was how I would describe my experience in Apron! Our journey was 6 hours long and I have enjoyed every second of it! The first impression truly amazing thanks to the professional stuff that welcomed us with a smile and so much positive energy. All the dishes we tried made me speechless. People who know me, know that I am not really open to experimenting with food and trying new things, but with the way the food in Apron was presented, I couldn’t resist giving every dish a try. Even fish, that I never, but really never eat. 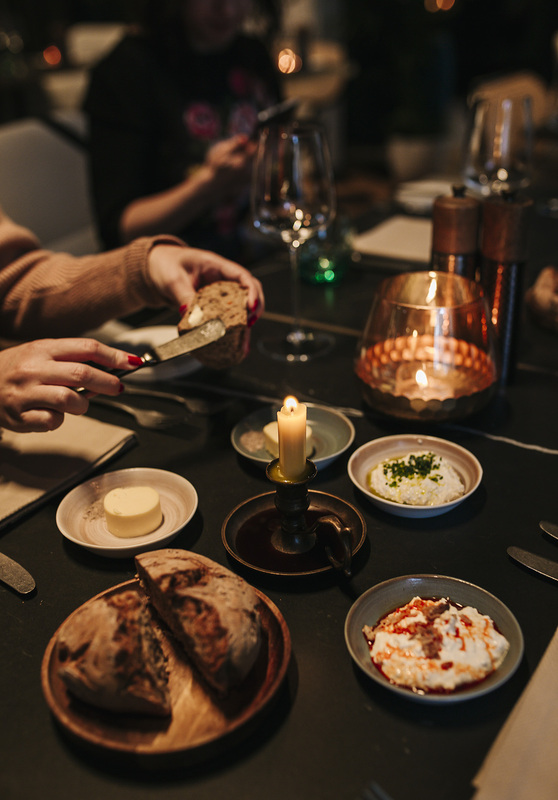 What wowed me the most was the butter candle with roasted meat sauce, and since I am the biggest potato fan out there, the stuffed baby potatoes served on edible dirt! And of course the desserts, especially souffle, made with so much love. Everything was unforgettable!